14th. April. Farquharson and Padre Miller to dinner. Convivial scenes. Saw Harragin on his road to the Transport Lines at midnight. Heard that we are to go into the line again on 18/19th. 16th. Hurriedly sent off to Bois-de-Boeufs in front of Tilloy to take charge of Corps Dropping Station to deal with aeroplane messages. Quiet day. Studied lie of the land and wrote letters home. Never saw an aeroplane. 17th. Went again to Corps Dropping Station. Found no one there, but noted that the place had been shelled in my absence. Waited an hour or two and then buzzed off. Heavy showers of hail. 18th. Told I was to be signalling officer again: vice Hood down the line sick for the third time. For one reason or another this is the 5th. time I have had to take his place. Fed up. Hate being shifted about. Have now been signalling officer 5 times, a/Adjutant once, a/Platoon officer 4 or 5 times, and Corps Dropping Officer. Also Billeting Officer, Intelligence Officer, Interpreter, and Road-maker etc. Expect I will get used to this in time! Plans and conferences for our next offensive on 23rd. between Monchy and Guémappe. Think it should come off alright. Am getting used to these conferences now, and don't take them so seriously as I used to do, even although it is a matter of life or death. Thank goodness the old C.O. has returned. He is a proper soldier (MacNeil). 19th. Little doing in the morning. After tea Beattie, Farquharson and I went out for a short stroll. After a bit we found ourselves at the cross roads at Feuchy Chapel on the Cambrai Road. Suddenly a shell dropped less than 20 yards from us and covered us all over with mud. I stepped into a deep puddle of mud in addition. We got pelted the whole road back, as the Boche began to fire at some of our guns coming up the road behind us. This was quite a nice walk. Lovely evening. Only we would have been safer on the other side of Arras. We had even forgotten our gas helmets and tin hats! 20th. More conferences. It seems to me that history will sum up the characteristics of this age, not as the electrical age etc., but as the age of Conferences, Concentration and Co-operation. Out looking for wire. Got some from the 29th. Division H.Q. 21st. Conferences again. Mess accounts. Left for the line at 7 p.m. South side of the road this time. Shrapnelled a bit at Maison Rouge. Rough passage across country in darkness to Bn. H.Q. Got there without casualties. Tremendous confusion, however, during the relief. Cursed the R.S.F. heartily, especially their guides, their Signalling Officer and their signalling sergeant. Made myself a bit unpopular with them, but it had to be done for their own good. Spent some time getting out 'B' Coy. onto the right road. Sunday 22nd. Went round line early with Signalling Corporal Mitchell. No phones allowed forward. Visited Coys. Everything quiet - too quiet in fact. Saw Tobermory Maclean, Wilson and Miller of 'D' Coy. They had had a bad night with shelling. The line was quiet now, and possessed all the advantages of a new line - these are:- no dugouts, no drains, no shelters and a painful obviousness to the enemy. Visited the Medical Officer at the Farm. Miller of 'B' Coy. wounded by shrapnel. He died later. Final arrangements for communication. Don't like Brigade Scheme. To Bn. H.Q. at night. Visited Brigade H.A. Saw G.O.C. and had a glass of port at his invitation - drinking to success on the morrow! All hopeful there! MONDAY, 23rd. April, 1917. A Black Monday. 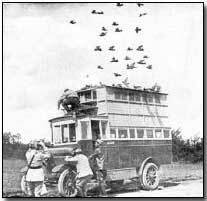 The Brigade was to jump off astride the Cambrai Road which ran diagonally across our front. Scots on left, Argylls on Right with a creeping barrage. An echelon type of attack. Up at 4.30 to see the strafe (from Bn. H.Q. about 800 yards behind the front line). Loud and heavy firing. Noticed loud and terribly ominous, quick and heavy retaliation on to our front line - and feared the worst. Then the usual rumours began. Ferguson of 'A' Coy. back wounded and with bad news. C.O. would not let me go forward to see what was happening. He allowed Muirhead to go instead. Muirhead got a very bad time of it. Our attack was a failure. The barrage was too fast and of the wrong nature and our men were mown down by guns and by M.G. fire. All the officers except Tobermory, A.G.Cameron and G.H.Mitchell were either killed or wounded. A.G. got 500 yards forward and into a gun pit with a few men, where I found him next morning. The Boche counter barrage was down as soon as ours. They had even been practising during the night and had given us a lot of trouble. A second attack took place at 8 a.m., but it was useless. Our form of barrage was to make up for the irregularities of our line. It proved impracticable. Our lot suffered tremendous casualties from M.G. fire in the outhouses of Guémappe. Camerons and Seaforths were in the same position. Royal Scots did well but suffered severely. They were in a more favourable position. Many soldiers lost direction too. Beattie, Farquharson and Willie Wilson killed. Southey and Padre Miller both mortally wounded. Padre Healy wounded, also Ferguson and MacIntyre, all officers. Tyson, our mess waiter, was also killed, poor kid. Tobermory came back to report about 3.30 p.m. after the 46th. Brigade had gone through. He was utterly played out, having slaved like a Trojan. Went forward myself and gathered the Battalion together in the darkness. Got 102, all told. No officers. Could not find A.G.Cameron or Mitchell in the darkness. Took men back to Bn. H.Q. Had to find my way in the darkness, but with the help of my servant and some signalling got them there alright. 24th. Waited for the dawn, and then roamed around, looking for A.G. and Mitchell. Found them with Bateman, well forward, the latter seriously wounded. Battlefield in a terrible mess. Boche used sulphurous and incendiary shells which made things indescribably bad. 46th. Brigade got Blue Line. Our Bn. and Brigade sent back to Brown Line. Trudged back with A.G. Cameron and Mitchell. Very hungry and tired. Sorley, J.G.Mitchell, and Capt. Leitch came up as reinforcements. Expect Battalion casualties to be about 300 all told. The Royal Scots hadn't an officer left. Took things easy, trying to sleep in an old Boche dugout. Pretty cold. No word of relief. Felt rather dirty. 3rd. Division said to be coming up. 25th. Reorganising everybody! Visit from Brigadier who was in good spirits in spite of the casualties. Only way to look at things! Was this "Another Glorious Victory" in the newspapers at home? 46th. Brigade in the Line. We are to relieve it tonight. Sent off in the afternoon to look for a H.Q. for the Bn. Got one. Shelled in an artillery dugout. Entrance packed with cordite or some such stuff. They set this on fire. I was out of that dugout before you could say "Wee Willie Winkie". Got H.Q. in a dugout near the Cambrai Road, near an artillery dugout. Laid new signal lines. 26th. Round the lines (i.e. Companies) with C.O. and Muirhead. It took some six hours hard going. Visited 2nd. Seaforths at Le Bergere Cross Roads, a most poisonous place. Was nearly called to a better, and let's hope, quieter land by some 5.9"s which landed on the little bank at the bottom of which I was walking - three yards away - C.O. and I created a record for the 50 yards sprint. 27th. Did not go round line in the morning. Went round later with McCallum the runner. Saw a company of the Suffolks being blown out of their trenches by a nasty barrage. Lot of sniping. Waited till almost dusk and then risked it across the open. Stayed in line, relieving A.G.Cameron. Made a shelter with Sorley and spent the night in it. Adjutant of the Suffolks shot accidentally. Raids on our right by the Camerons and Gordons on the farm in front of us. 28th. Heavy attack on our left. Barrage in front of us by our own guns. Everybody too tired to take any notice. Fine day. Bn. relieved at night. I was left behind for 24 hours to stay with 8th. Middlesex. Stayed at their Bn. H.Q. and looked after guides. It was funny to see these Englishmen coming along the trenches, sweating, with greatcoats and full kit on a lovely summer's day! We had had nothing but waterproof sheets. Left at 2 p.m. Missed some nasty shelling and got back to Arras for a bath and food. Bus at 10 o'clock that same night to Berneville, S.E. of Arras. Arrived near midnight. 30th. Sunday. Should be as for 29th. Have lost a day somewhere. 1st. May. To Arras for money. 2nd. to 4th. Sunday rides around the area. New officers have arrived, including Willie Haldane who played in the school rugger team with me. David Robertson and Colin Mitchell also arrived. No word of leave yet. 6th. May. Sunday. Uninspiring service by Padre Kelly of the Camerons. Football in afternoon and watched a good game at night. The recuperative powers of the British Tommy are wonderful. 7th. Blanket fatigue to Wanquentin. Division transferred to XVIII Corps for training - this does not augur well. We are to go further back - high time too! No word of leave yet. Glorious weather. Major Duncan, the "Conscientious Obstructor", in command, as Col. MacNeil has died. 8th. March to Sus St. Leger. 9th. Rode over to Souich and Lucheux with Robertson. Glorious ride and lovely part of the country. Gave Robertson a hot time as he had never been on a horse before. Football match at night. 5 and 6 platoons against 7 and 8. Latter won by 4 goals to 1. 11th. May. A field day with Richards in command. Football. Away riding with Hollins before brekker. Range. Felt disinclined to work. Then a field day under the General's eye. Good fun. Back at 8.30. More conferences. Paid the company. Got word that 10 days leave has been granted to me. Also got word that I can't go on leave - have to take over temporarily as Adjutant. Cheerful! 12th. Plenty of fun. Very busy, yet time for a canter. Adjutant of the Day for Brigade - had to borrow a tunic and kilt for the show. Quite imposing Guards Parade which I got through without any big mistakes. 14th. May. Field Day. Then buzzed off on leave. Horse to Frevent. Train via Doullens to Abbeville, and then Paris Express from there to Boulogne. Crossed on 16th. Then forgot all about the war for ten days. Succeeded wonderfully well. The details about my leave might be interesting but they don't matter much now. Sunday 27th. May. Crossed again from Folkstone to France. Not seasick for a wonder. Boulogne at night. Went on to river. Stayed at the Louvre Hotel. Monday 28th. To Etaples, with early train. Paris Plage in afternoon. Disgracefully quiet. Dinner in Officer's Club. Then wrote an awful lot of nonsense in my diary at night. Note from RLM, 1972: That would be about my leave, etc.!!!! I forget now. Tuesday, 29th. May. The Adjutant of the Depot told me I would not get up the line until tomorrow. Felt I could not stand another day in the wretched base so, without saying "By your Leave" to the adjutant I got out the back door, and bluffing the Railway Transport Officer I got on a French passenger train which took me to Hesdin by 11 a.m. - only a short distance from Le Quesnoy where I found the battalion in glorious surroundings. Gibb Mitchell the O.C. Coy. is at the seaside recuperating and a fellow Macleod is in command of the company. Robertson still there and McCallum is back. Wednesday 30th. Might still have been at the base, eaten by, and eating, flies. Trial inspection parade for visit of C.-in-C. of French armies tomorrow. Of course, tomorrow came, but the C.-in-C. didn't! Bath parade to Caumont, 5 miles off. Thursday 31st. Felt sad. Was it the all day fruitless parade? or the reaction of leave? Friday 1st. June. Field day. Awfully funny. Macleod lost himself, attacking the enemy on a front of 5,000 yards with a company 30 strong, organised in 4 platoons of 4 sections each. Strength of section = 1 man, commanded by himself! This is the only 'mistake' that Macleod ever made. (Note from RLM, 1972: But such was our company strength at this time, instead of 200.) In action afterwards, he showed himself absolutely magnificent, and extremely efficient. Dined with 'A' Company. Read the Browning Love Letters at night, in bed. Disappointed, though not displeased. Felt I could have written a better love letter myself in spite of my tender years - and lack of experience. Saturday 2nd. Heard that "Strafer" Campbell, the adjutant is going away to a base job, and that a new adjutant is required. Three names mentioned for the job - Hood, Macleod and myself. Would like the work immensely, but fear there is absolutely no chance. Great meeting at night at 'A' Coy. to celebrate A.G.Cameron's well earned Military Cross. Sunday 3rd. June. Church Parade. Took over 'B' Coy. vice Macleod who becomes adjutant. Out riding in afternoon on "Donald" (the MO's horse) looking over the manoeuvre ground. The beast bolted, I lost my stirrup and cap, and couldn't stop the brute. Nearly had many accidents. After going about two miles like old John Gilpin it stopped. Then we cantered back the same distance, a few miles, to pick up the various parts of my equipment which lay on the road! News of the death of Colonel MacNeil at the base. Monday 4th. Out all day as O.C. No. 1 Coy. in outpost. Got on very well. 7th. Harry Lauder came to us at night, accompanied by William Hogg, M.P., a Liberal, I'm sorry to say, but a notoriety hunter. His speech to the men was in shocking taste and very ill-chosen. 8th. Lauder again. A party of us rode over to seen him. 9th. Practising with tanks. A full day. 10th. Church parade. Cricket against Royal Scots. Did rather well. Won by 1 run. Reading the Browning Love letters in my spare time. 16th. Swimming in the River Conche. Ride in a tank. Toothache. Tremendous heat. Sunday. 17th. Lay in bed until 10 a.m. Some luxury for Active Service! Cycled into Hesdin with Robertson. 18th. Prosecuting at Field General Courtmartial at Fontaine l'Etalon. Very hot day, yet we had hailstones 3/8" in diameter. General McCracken has left the Division, promoted to a Corps. This is a very serious loss indeed as we may not get a man to understand us so well. We need, too, a Scotsman to lead a Scotch Division. Rumour has it that our duty in the coming offensive is to take us to the most salient point of the front at Ypres. Expect that it will be grand show, though we certainly won't take the Hun by surprise as we did two months ago at Arras. 19th. Out training signallers and observers. The former very efficient, the latter the very reverse. We are to move on the 21st. Heard that my school (Hillhead H.S.) are sending out 10,000 cigarettes to the battalion. Very decent indeed! Finished "Micky O'Halloran" by Gene Stratton Porter. 21st. June. Left Le Quesnoy with regret, after having a tremendous row with Major Wilson, O.C. Battalion at the time. As he afterwards, (next day or that day) apologised, everything is now forgotten. Arrived late at night at Blangermont Chateau. Acting as O.C. Coy. We had to leave an officer behind at Le Quesnoy till next day to look after about 20 to 30 of our weaker brethren who could not march owing to the boisterousness and thoroughness of their farewell to the place. Willie Haldane was detailed for this rather unpleasant job. Nearly every man in 'D' Coy. had his waterbottle filled with beer, instead of the regulation water, in spite of orders. The officers however didn't take much notice at the inspection parade before marching off, but when we got on the move the beer became frothy and bubbled over on their kilts. Major Wilson, this was his first experience in commanding the Battalion, dealt most admirably with this delicate situation. 22nd. Blangermont to Tangry. Good billets. Met George Morton plus spurs in a motor car just outside St. Pol. Talked with him on the march about old times and exchanged news about our old school. 23rd. To Auchy-au-Bois as O.C. Advanced Guard. J.F.C.Cameron coming to 'B' Coy. as O.C. Coy., probably - reason, to see if charge of a company steadies him! He made the interpreter helpless at Tangry! 25th. Left early for Boesinghem. Men marching well - none falling out despite the long distances. Rotten billets. Rode into Aire with Robertson and Gray for dinner. Had some trouble afterwards with my horse, but got back alright! 26th. March to Caestre. Air raid. 27th. Still marching. Up at 3 a.m. and marched into Belgium, via Forge, behind Poperinghe. Bad roads. Country here very flat. Inhabitants different too. Flemish spoken more. French less common. 30th. Marched to near St. Omer - 22 miles, and it rained all the time. 1st. July. Church parade. Quite noisy again. Bombardment going on. Hope the guns do their work well and save us casualties. 3rd. Battalion practice for the coming show. Cycled with Robertson and McCallum into St. Omer at night. Left at 6.15 p.m. and were getting on fine when we reached the top of the last hill about the town. Began to free-wheel down. I followed Robertson who was going down pretty fast and who was rapidly overtaking some cyclists in front. Meanwhile my pace increased at a deuce of a rate and my front wheel began to rattle. Found my brakes were bust. Passed Robertson at a terrific rate but found myself running into a horse and cart and two motorists coming towards me from round a corner at the bottom. Don't know how I got past, for the horse began to rear. Then there was a collision behind me (Robertson and the motorists) and a noise below me (my tyre bursting) followed by a jagged rattle as some spokes went west and I found myself disentangling myself from the ruins of the bike at the foot of the hill and being helped up by a sentry of the 7th. Bn. Argylls, of the 51st. Division! Robertson had a wonderful escape, carrying away one of the motor cyclist's pedals and knocking the man in the side car senseless. When I went back I found him only able to stammer "Me Shocky" (He was a Belgian). Jove! I should think he was. Tried to get a new wheel for my bike from a 4th. Gordon Sergeant. Went into St. Omer and had a nice quiet dinner. Back to the Bn. before midnight. 5th. Company out on working party. Easy day. Offered job of assistant adjutant. Gibb Mitchell to England. 6th. Brigade Field Day. Made Assistant Adjutant. I accepted it on condition the job would not keep me out of the trenches. 8th. Left for Arneke to get train to Toronto Camp, half way between Poperinghe and Ypres. No arrangements made for our coming, so we annexed a camp. Busy day. Battalion went up to map square H16 at night to 'Bivies' (bivouacs) shelters etc. I was left behind to look after 'details' at Toronto Camp, a lousy place in a real sense. While not built as a permanent camp it had been used continually as such for three years. 9th. Very busy. This job is no sinecure. 10th. The battalion had 85 casualties last night while relieving the Seaforths. A raid came over. Hun strafed. Our leading companies caught in the barrage - a box one - confusion, and a jam up. The men could not move forward or back. Lieut. Blyth killed. Haldane seriously wounded, Mills slightly. At the moment our figures are 12 killed, 44 wounded and 29 missing among the men. Some of these poor beggars had never seen war or trenches before, in daylight. They went up in the dark and either fell or were brought out in the dark. A man hardened to it does not mind so much, but it must be terrible for a new fellow. Willie Haldane lost a leg. He was a splendid three quarter at school. 11th. At Field General Courtmartial in the locally famous McMahon case. I set off with Wright, my runner. (I had dismissed Milligan for impudence, even although I had had him for a year). The first few miles were dusty and not dangerous. Then came a rotten bit. I had intended going along a corduroy track over a marsh, but the near end of it, "Shrapnel Corner" was getting hell when I came up, so I moved slightly to the left along the Roulers Railway. As soon as I was getting on to it a shower of 5.9"s began to fall so I had to get nearer to Shrapnel Corner again and work my way in between the two places. I next crossed the railway near "Hell Fire Corner", a very nasty spot, and struck out for Dragoon Farm, our Bn. H.Q. Got pestered with desultory shelling all the time. Owing to the fact that the Huns were round us on three sides of the salient he had only to direct his fire into the centre and he was sure to hit something or other, a store, a dump, a cross road with traffic or a dugout. Every night during this Ypres offensive he succeeded in putting up one or more dumps of ours. Big and dangerous blazes they made too, some leaving holes or craters 30 feet deep and 60 feet wide. I found H.Q. alright, but it wasn't a farm - just a sort of primeval hut covered over with sods and incapable of resisting even a pip-squeak. Open, too, to the four winds of heaven. Had lunch and then went round the whole line and saw the companies. Strange trenches - quite different from the ditches of Arras and the Somme. Here they were all boarded and revetted, besides being banked up at the sides. At the same time too the sides and parapets were covered with beautiful poppies and daisies. There would be about a foot of water in the bottom of all the trenches. It was really a wonderful sight! Piccadilly trench where we lost all these 85 men was being well attended to by 5.9"s when I was going up, so I gave it the slip and went up another trench. Never like to see poppies now, as it makes me remember the wretchedness of Ypres, and of this particular trench, when, two nights ago, my company lost four sergeants killed. Went round the line. Tea in a filthy little shelter in the support line. Left Bn. H.Q. at 6.30 p.m. and came back via Ypres. Easy up to a point. Back by Menin Gate and the Ramparts. Passed by the ruins of the Cloth Hall. Not a soul to be seen in the whole of the square. Terrible feeling of loneliness. Felt like the last man left alive, or as though I had been asleep for centuries and had awoken to find every one dead, and the world in decay and ruin. 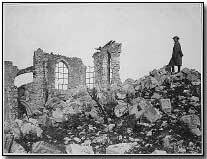 After every memory of adventures, escapes, battles has left me, I think (to use an Irishism) one will still remain, that of the look and atmosphere of Ypres in 1917. As we were getting out by the North West Gate, the Hun began to crump the Station with heavies. Wright increased his pace from the regulation 27 inches to 37 inches. I probably beat that! Struck off across country from the Asylum. Things were now quieter. Just as we were approaching Divl. H.Q. I decided to cut a corner. Lucky I did so, for at the very instant at which I reckoned I'd been turning that corner down came some long range stuff. Got back to Toronto Camp - no sooner back than the camp was shelled. This was about 8 miles behind the line! One shell burst about 30 yards from us and we all got spluttered with mud. Such is life in the Ypres Salient! And it is the same every day now. 13th. Managed to put myself on a special course for aeroplane instruction. 2 days it lasts. We should then be taken up in a plane. It will be a change from the monotony of life on the ground. 9,000 cigarettes arrived from Hillhead School. Top hole! Three balloons brought down today. 14th. Up early. Bus to the other side of Poperinghe where I idled away time with the Royal Flying Corps until 3 p.m. Toronto Camp shelled at intervals during the day and night, causing casualties to men and animals. 15th. To R.F.C. again. Gusty day. Disappointed at not getting up. Lot of work on return. Odd ammunition dumps going up at intervals during the day. Our serial offensive and other preparations began today. Rode to H16.c (map square) to meet battalion coming out. Long wait, till after 6 a.m. Am being told that I am now a bit thinner. Got to bed at 8 a.m. today (16th). Up again at 12 and worked with MacLeod. 17th. My left arm slightly poisoned and a little sore. 19th. Reconnoitering billeting area on horseback. 20th. Summaries of evidence. Clearing up in afternoon. Long wait - till after midnight, on Bn. coming out. Heavy bombardment by our guns. 21st. Easy day. Cycled away just as the Hun was dropping some heavy stuff into Toronto Camp. Billeted in L13. Officers in tents. Saw Bn. in alright. 22nd. Sunday. Busy all day. Toothache all day. 24th. Detailed to take A.D.M.S. 's party on Zero Day. Got soaked to the skin. Lunch in Poperinghe. Saw A.D.M.S. and got instructions as to my duties. Thursday 26th. To St. Lawrence Camp. 28th. Rode over to inspect some ground. Push postponed. Hun said to have left his front line. Wise man! Collapse of Russia. 29th. July 1917. A bit wet. And a Sunday.